A man who gave his "favourite" £120 trainers to a barefoot homeless man says the act has inspired other good deeds after his story was shared around the world. 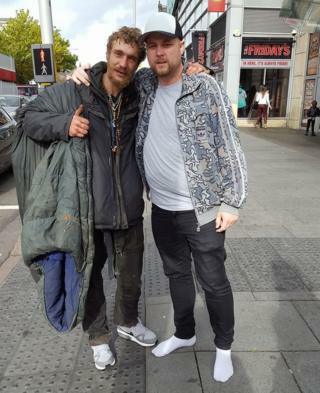 Craig Wells ran out of a restaurant in Nottingham after seeing the homeless man, Mark, walk past wearing no shoes. He said Mark "started to cry and gave me the biggest hug" after the gift. Mr Wells shared a photo on Facebook to encourage other people to "pass it on" and help someone in need. "There is nothing worse than self praise and I certainly don't want it," wrote Mr Wells, from Chesterfield. "If someone is encouraged to step out and help someone in need by this message then Love wins!!!" Since then, the photo has been shared more than 4,000 times and liked more than 9,000 times. Mr Wells said it resulted in "hundreds of private messages" from people "all over the world". One man from Jakarta in Indonesia told Mr Wells he had gone out and bought lunch for a homeless person. "It may sound a bit fluffy but love really does make a difference in a world," said Mr Wells. He said he had also heard from several members of Mark's family who thanked him for "being so kind". Mr Wells, who describes himself as a "committed Christian" and attends Christian Life Church in Chesterfield, said he simply wants to "open people's eyes and offer hope to the homeless and other people in need". Should we give every homeless person a home?